Hazel Class is taught by Mrs Crick and supported by Mrs Berger. We are a mixed Year 5/6 class of 26 children, made up of 18 Year 6 children and 8 of the older Year 5 children. It's a great combination and we have lots of fun with our learning together. This term, our topic is Gallery Rebels where the children will examine the history of art and artists throughout time. We will explore different periods of history such as expressionism, surrealism, cubism, realism and impressionism. In Literacy we will focus on explanation texts about famous artists, narratives and poetry. In Numeracy, we will continue to revise the four rules of number; using and applying number skills in everyday situations with a focus on decimals and percentages. To help your child, it would be useful to practise multiplication and division facts for 2 to 12+ multiplication tables, so the children know these off by heart; also the doubles and halves of 2 and 3 digit numbers and decimal numbers. Teamwork - how to transport water using just five sheets of A4 paper! Investigating solids and liquids during Science Week. Preparing for the annual duck race - having a stocktake! Starting the afternoon with some relaxing yoga. Discussing important issues with PC Nick. 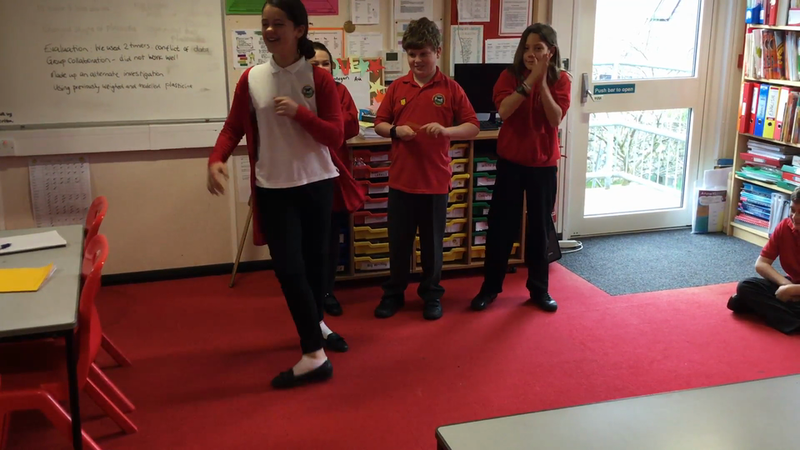 Year 6 enjoying a music lesson at Cowbridge Comprehensive School. 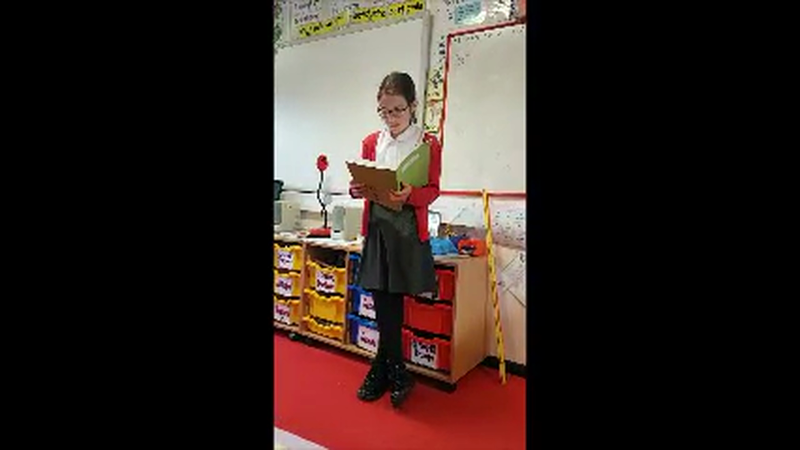 Competing in the class book quiz. The naming of the Bard. 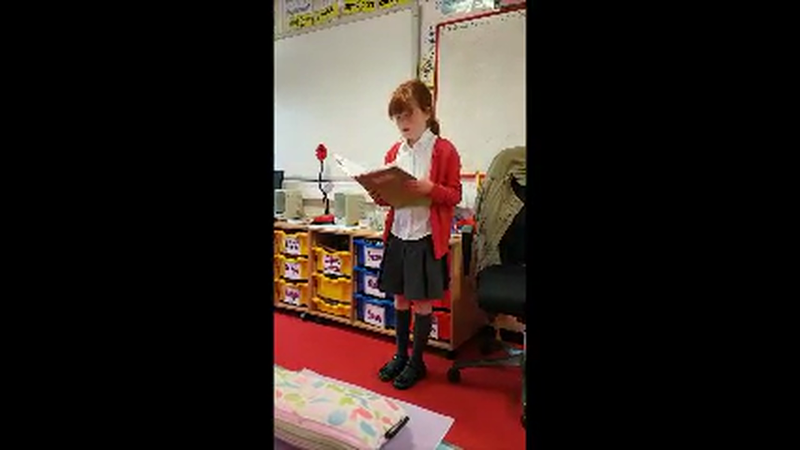 Class Hazel's contribution to the Eisteddfod 2019! Year 6 investigated forces during Science Week. Picking up debating tips at the English Union Debating Workshop. 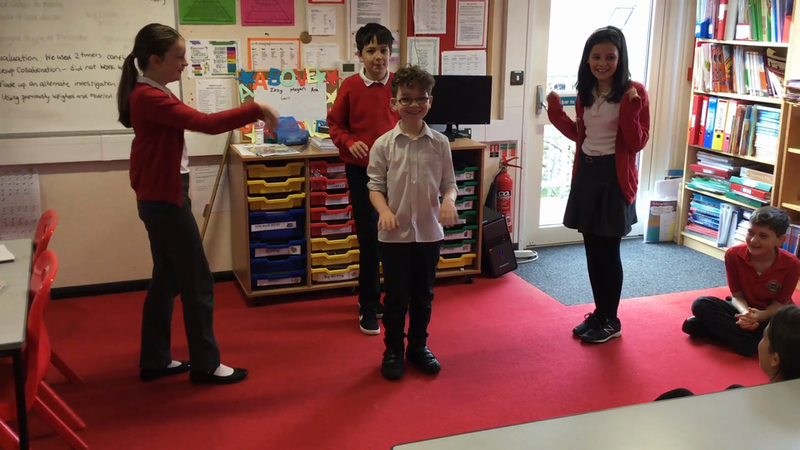 Celebrating St Valentine's Day with a disco! Hazel Class representatives took part in an exciting science workshop at Cowbridge Comprehensive School. We really enjoyed examining some WWII artefacts! 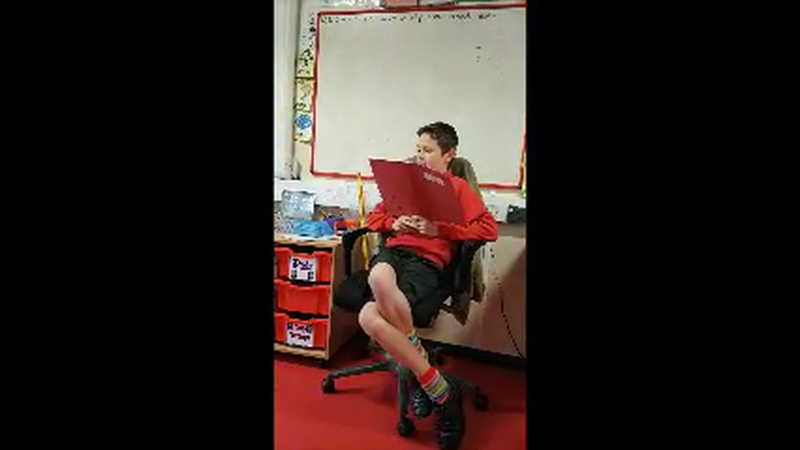 Hazel Class showcased last term's learning in their class assembly. This term, our topic is Frozen Kingdom where the children will learn about the polar regions, their extreme ecosystems and how animals and humans seek to conquer them. In Literacy we will focus on non-chronological report writing, short narratives, diary and newspaper writing as we investigate the physical features of the region such as icebergs and the Northern Lights; we will also explore and uncover the true legend of the Titanic and research those explorers such as Robert Falcon Scott and Ernest Shackleton, brave men who sought to reach the South Pole. In support of Welsh Government and local legislation we are continuing to actively promote Llancarfan as a healthy school. Could we ask for your continued support in providing your child with a healthy snack for break time. Snacks can include all fruits, vegetables and cereal bars, BUT please can we ask that children DO NOT bring nuts to school. Children will be bringing home “Learning Logs”. These are open ended research activities for the children to complete over the following week Monday to Monday. Activities will be Literacy and Topic based to further consolidate learning that is taking place in class; additional, differentiated Maths activities will be sent home when appropriate to support your child’s learning. PE is scheduled for Friday afternoon. Please could you ensure children bring their kit to school (they can leave it on their pegs). Could we ask that children bring their reading books to school daily. Regular reading practice is essential for every child’s progress and we very much appreciate your support in this. As a reminder, we would expect your child to read at least 4/5 times per week. Your child will either have a reading scheme book and/or school library book to read from or their own choice from home or a public library. Please ensure that your child brings their Reading Record to school every day and please sign or comment on their progress. Trimming the tree at St Cadoc's Church! Busy making angels for the local church's Christmas Tree Competition. Learning about diffusion and osmosis during Science Week. Our World War II weaponry. We designed our own St George's Medal. We had the opportunity to learn taekwando, dance and multi sports skills at St Donat's. Representatives from Hazel Class paid their respects and laid a handmade wreath at the village cenotaph. The wreath featured personalised messages from the children. To commemorate the centenary of the WWI Armistice, the children created war based artwork using silhouettes. Due to the sheer breadth of our topic, we have decided to continue with A Child’s War which will culminate with a visit to Barry War Museum where the children will have access to a range of authentic wartime experiences! In Numeracy, the children will continue to use and apply number skills in everyday situations; calculate the areas of squares and rectangles; read and interpret scales or divisions on a range of measuring instruments; recognise reflex angles and draw and identify nets. In Language, Literacy and Communication, we will be looking at the use of persuasive language in propaganda in addition to biographical writing. Our topic this half term is A Child’s War. We will be learning about World War II and why the Battle of Britain was such a significant turning point in British History. We will learn about the timeline of events and research the lives of ordinary people who faced the Blitz and the challenge of dealing with rationing and evacuation. In Numeracy, we will revise the four rules of number; using and applying number skills in everyday situations; fractions and decimals and problem solving. To help your child, it would be useful to practise multiplication and division facts for 2 to 12+ multiplication tables, so the children know these off by heart; also the doubles and halves of 2 and 3 digit numbers and decimal numbers. In support of Welsh Government and local legislation we are continuing to actively promote Llancarfan as a healthy school. Could we ask for your continued support in providing your child with a daily healthy snack for break time. Snacks can include all fruits, vegetables and cereal bars BUT please can we ask that children DO NOT bring nuts to school. PE is scheduled for Friday afternoon. This term, we will focus on hockey skills and drills. Please could you ensure children bring their kit to school (they can leave it on their pegs). Please encourage your child to bring their Reading Record to school every day and please sign or comment on their progress. What a fabulous start to the year - how have we managed to fit it all in? We learnt about the role of Magistrates in the community. During our Science week, we have been investigating gas production when yeast is mixed with different water temperatures. Year 5 and Year 6 took part in the Rural Vale Cross Country Meeting. We visited the Houses of Parliament to learn about debating and law making. 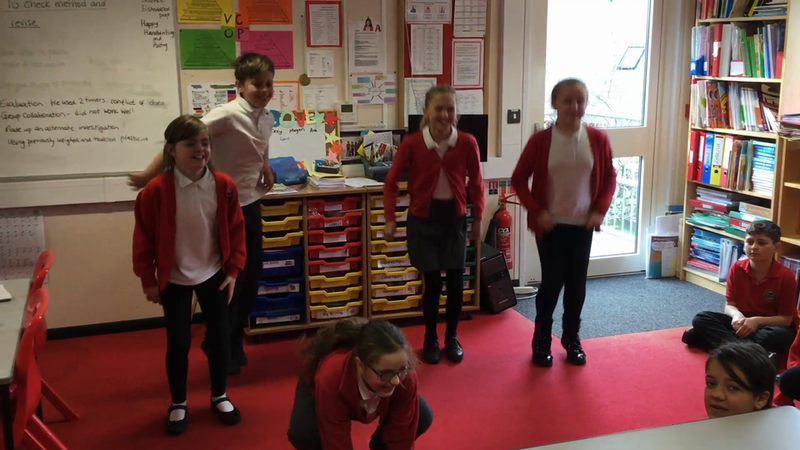 Year 6 children took part in a creative dance workshop. Hazel Class is taught by Mrs Crick and supported by Mrs Rose. We are a mixed Year 5/6 class of 26 children, made up of 19 Year 6 children and 7 of the older Year 5 children. It's a great combination and we have lots of fun with our learning together. Guide Dogs Cymru paid a visit to Llancarfan to run a workshop for KS2 pupils and to award an outstanding certificate for their road safety competition. Two teams of Year 5/6 children attended an athletics meeting at Jenner Park, Barry competing against 21 other schools in the Vale; events included: Vortex throw; Standing Long Jump; 600m and 100m Sprint. Year 6 attended Crucial Crew Workshops. Did you know that recycled tins are used to make cars, coaches and even planes? Did you know that Nutella jars are used to resurface roads? Year 6 found out these fascinating facts when they attended a very informative Crucial Crew Workshop today at RAF St Athan. The children were introduced to a range of organisations at the Workshop from The Samaritans to Network Rail who engaged the children in entertaining but ultimately useful and informative sessions, teaching them about the potential risks in real life situations and how to deal with them. Thanks Crucial Crew for such an engaging and informative session! During this half of the Spring Term, our topic is Potions. This topic has a science focus and teaches the children about the changing state of materials including solids, liquids and gases. We will read about inventors who have created everyday potions such as Cocoa Cola, Cadbury's Chocolate and Body Shop lotions in addition to carrying out practical investigations as we develop an understanding of melting, dissolving, mixing and the effect of heat on a range of ingredients through simple cookery tasks. In Literacy we will study instructional text, the use of persuasive language and letter writing. In Numeracy, we will revise the four rules of number; using and applying number skills in everyday situations; fractions and decimals and problem solving, with particular emphasis on measures and handling data. To help your child, it would be useful to practise multiplication and division facts for 2 to 12+ multiplication tables so the children know these off by heart; also the doubles and halves of 2 and 3 digit numbers and decimal numbers. As a reminder, we would expect your child to read to you at least 4/5 times per week. He/she will either have a reading scheme book and/or school library book to read from, or his/her own choice from home or a public library. Please encourage your child to remember to bring their reading record to school every day. This term, P.E. is scheduled for Monday afternoon. Could you please ensure your child brings PE kit to school. We have been busy investigating proportion. Practical investigations using our measuring skills. Cookery is definitely a science! Investigating reversible and irreversible changes whilst making flapjacks! Year 6 School Council representatives met with their Vale counterparts to discuss best practice. Junior Road Safety Officers in the making! We have had a busy Science Week looking at bugs and drugs. Are your hands clean, Hazel Class? Move over Paul Hollywood, Hazel Class has a few budding bakers in the making! During this half of the Autumn Term, our topic is It’s a Wonderful World. This topic has a geography focus and teaches the children about the geographical and historical significance of recognised Wonders of the World. The children will learn about the locations of the Ancient and Modern Wonders of World including the countries in which they are located and about their geographical, historical and cultural differences. 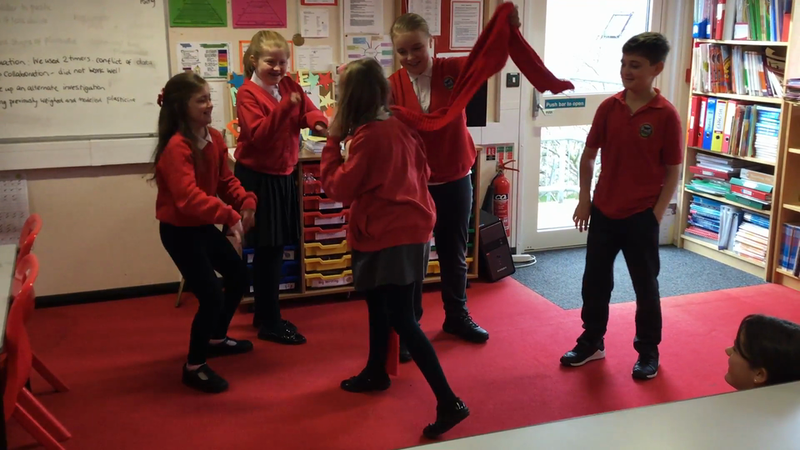 They will learn how to use maps, plans, data and information to find out about a range of places and will develop a tourism package presenting their very own Welsh 7 Wonders. In Numeracy, they will revise the four rules of number; using and applying number skills in everyday situations; fractions and decimals and problem solving. As a reminder, we would expect your child to read at least 4/5 times per week. Your child will either have a reading scheme book and/or school library book to read from or their own choice from home or a public library. Please encourage your child to remember to bring their reading record to school every day. FYI, P.E. is scheduled for Thursday afternoon. Maths homework will be handed out on a Friday and due in on Monday. Spellings will be handed out on Monday and will be tested on the following Monday. We are a mixed Year 5/6 class boasting 22 children in total; there are fourteen Year 6 children and eight Year 5 children. This term we have been learning about World War II and why the Battle of Britain was such a significant turning point in British History. We are learning about the timeline of events and researching the lives of ordinary people who faced the Blitz and the challenge of dealing with rationing and evacuation. We look forward to presenting our learning at our Class Assembly on Thursday 22nd June. Our athletes performed well at the Quad Athletics Final held at Cardiff Metropolitan University. 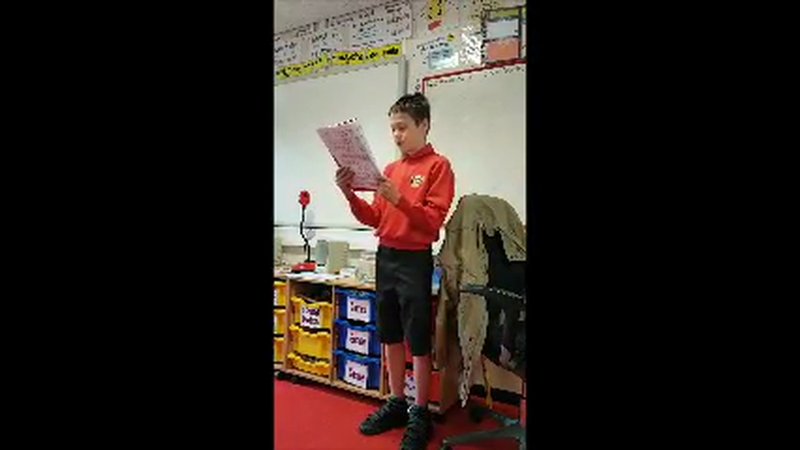 Alicia, Megan, Molly, Freya, Henry, Jack, Morgan, Reuben, Max, and Dominik from Year 6 together with Alice, Charlotte, Erin, Alex, Caelen and Gethin from Year 5. Well done to everybody who took part and grateful thanks to those parents who ferried the athletes to and from the venue! Team A are through to the FINAL which will take place in July! Did you know that recycled tins are used to make cars, coaches and even planes? Did you know that Nutella jars are used to resurface roads? Year 6 found out these fascinating facts when they attended a very informative Crucial Crew Workshop today at Barry RFC. The children were introduced to a range of organisations at the Workshop, from The Dogs Trust to Network Rail who engaged the children in entertaining but ultimately useful and informative sessions teaching them about the potential risks in real life situations and how to deal with them. Year 6 learned how to stay safe when out and about and what to do if they were to find themselves in a threatening situation. Effective self-defence techniques were discussed and practised by several volunteers – just take a look at the photos! In addition to the dangers associated with electricity and railway tracks, they learnt about the three Ps (Waste Awareness) and the four Cs (Food Standards Agency) - Do ask any Year 6 about these! The Fire Brigade were also present and delivered an engaging session on the dangers in the home. Did you know that kettles and toasters should always be turned off at the wall socket after use? Spooky stories - our fab literacy work. Reasoning Skills Try these brain blasters! Practise your Big Maths skills here!